BELMOPAN, Belize, February 2, 2018 (ENS) – While President Donald Trump intends to open nearly all U.S. waters to offshore oil development for the first time, the country with the largest coral reef in the Western Hemisphere has banned offshore oil drilling to protect its natural heritage and fishing industry. The Central American country of Belize is caretaker of the world’s second longest barrier reef, which runs along its east coast. 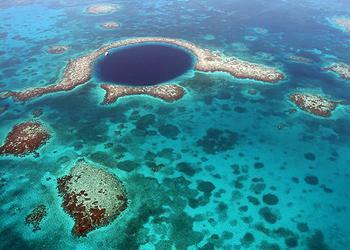 The 200-mile-long Belize Barrier Reef Reserve System is a UNESCO World Heritage site. It is part of a 560-mile-long Mesoamerican Barrier Reef, which touches the coasts of Mexico, Belize, Guatemala and Honduras. The Mesoamerican Barrier Reef contains the largest barrier reef in both the Western and the Northern Hemispheres, stretching nearly 700 miles from the northern tip of the Yucatan Peninsula down through the Honduran Bay Islands. Belize made history in late December by unanimously passing the Petroleum Operations (Offshore Zone Moratorium) Bill, 2017, which places an indefinite moratorium on offshore oil development in Belize’s marine territory. The new law makes it an offense to conduct oil exploration or extraction activities in Belize’s territorial waters. Violators face a fine of up to $3 million, imprisonment of up to two years, or a combination of both. The legislation comes after years of advocacy, a blocked referendum and court battles. Early this century, most of Belize’s 8,867 square miles of territory and much of the country’s offshore waters were allocated in petroleum concessions to 18 different companies with a range of foreign shareholders from as close as the United States and as far as Taiwan. Belize Natural Energy has one of those 18 contracts, and it has been the only company producing and exporting oil from the country, since it found oil in Belize in 2005. In April 2010, the three-month-long Deepwater Horizon oil spill in the Gulf of Mexico heightened concern about proposed oil exploration in Belize’s offshore areas. In 2013, Belizean Attorney Audrey Matura won a groundbreaking victory when a judge declared six offshore oil contracts null and void. ELAW, a U.S.-based nonprofit that helps communities world-wide protect the environment and public health through law, provided legal support to Matura and the lawyers representing Oceana, Citizens Organized for Liberty and Action, and the Belize Coalition to Save Our Natural Heritage in this case. Emboldened by this legal victory, Belizeans country-wide went on to advocate for a permanent ban on oil development in their coastal waters. “Hats off to the determined people of Belize for seeing this all the way through,” said ELAW Associate Director Lori Maddox, who coordinates ELAW’s work in the Mesoamerican Reef region. The Belize Barrier Reef Reserve System is one interconnected system comprised of seven marine protected areas located along the length of the barrier reef, the shelf lagoon and offshore atolls. It represents all the main reef and coastal habitats, including rare littoral forest on sand cayes that are inhabited by endangered plants and animals. Endangered species protected within the Belize Barrier Reef Reserve System include: the West Indian manatee, the American crocodile and three species of sea turtle. The BBRRS is home to species found nowhere else – Yucatan birds, island lizards, fishes and sponges – giving it one of the highest levels of marine biodiversity in the Atlantic. 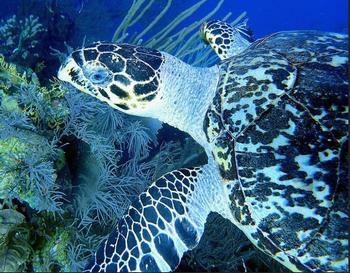 The endangered hawksbill turtle, manatees, and six threatened species of shark live in these waters. The reef is made up of healthy corals, and aquatic animals shelter their young in mangrove forests fringing the coast. Belize’s economy is built on tourism, which is estimated to bring in between US$182 million to $237 million per year. Reef-related tourism and fisheries support an estimated 190,000 people. “By acting to remove a major threat to the reef, Belize is safeguarding its future prosperity,” Bood said. She expressed the hope that Belize’s move will encourage other countries to follow suit. The Belize Coalition to Save our Natural Heritage, made up of more than 40 environmental, industry and social organizations has been fighting for years to protect the Belize Barrier Reef Reserve System.